We cultivate five hectares of vineyards in small fields between stony and silty hillsides located along the valley of the Crostolo stream. We have kept the oldest varieties of Reggio Emilia as the Spergola (in our historic vineyard of 1970), the Malbo Gentile, the Lambrusco di Montericco, the Sgavetta and many others. A continuous commitment of study and recovery that also involves researchers and students of the University of Modena and Reggio Emilia. The care of the vitality of soils without irrigation or chemical fertilizers allows each variety to express its whole character without compromise, making the vintages of each of our bottles unique and unrepeatable. Our grounds insert themselves into the hills at the feet of Tuscan-Emilian Apennines. This is an area that origins from very complex geological movements, because they are linked to motions of rocks of the ancient Ligurian ocean, a sea that millions of years ago was a barrier from the Iberian-European continent and the Apulian-African one. This is a region of confines and of massive motions of telluric stratums which last from Jurassic to Miocene until the latest glaciations (from 150 million of years ago to 500.000 years ago). due North-West into the deep Ligurian ocean, there are igneous rocks that move for both the push and the rotation of Iberian continent. It’s a very active area. due South-East in the Umbrian-Tuscan side of the Ligurian sea you can see a series of complex sedimentations, that brings limestone sediments, marl and red mud and faint deposits. Between 150 and 45 millions of years ago the pushes of first rocks against the second ones generates the Apennines and a very complex hilly land, thanks to the downwards movements of Ligurian rocks and the motion of Tuscan sediments. Since 25 millions of years ago, the Ligurian rocks’ pushes move massive quantity of water that produces violent erosions and faint deposits. 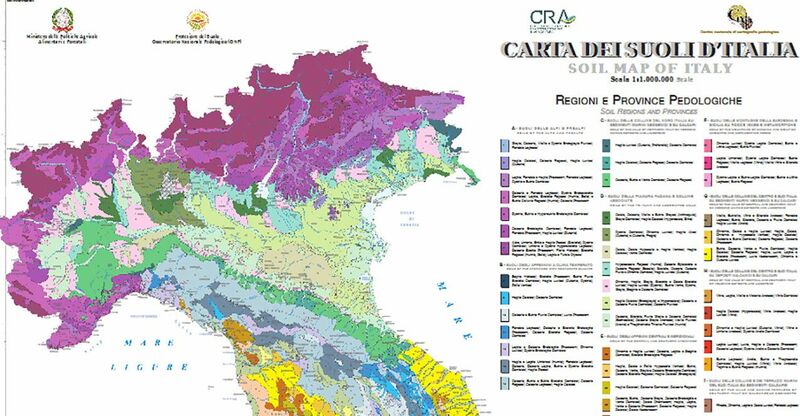 For this reason the lands keep surfacing with a considerable complexity of soils, with a prevalence of silt, red sediments and limestone areas. 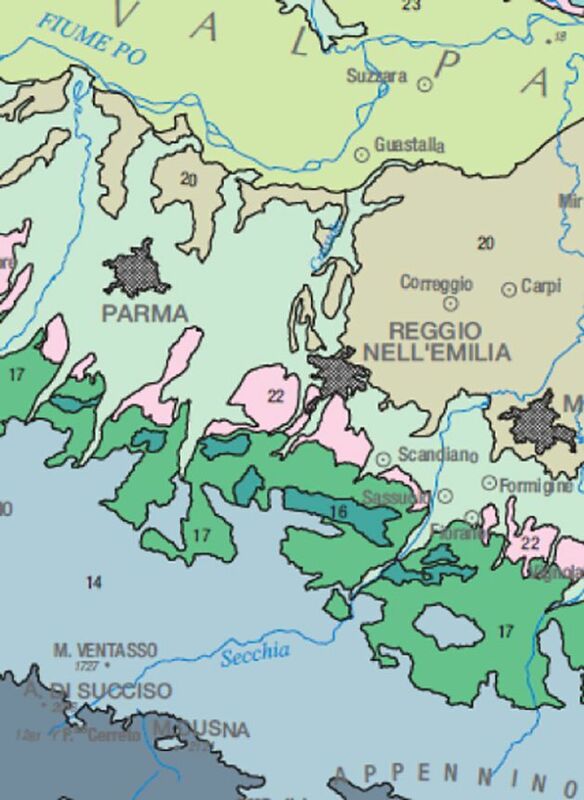 Geologists evaluated that the velocity of this huge push of undersea rocks was around 1 cm/year and last until 10 millions of years ago with a motion front of 250 km such to separate the Ligurian sea from the Po valley. Between 10 and 5 millions of years ago, a continuous raising of hilly lands takes place with erosion of Ligurian rocks and faint deposits. 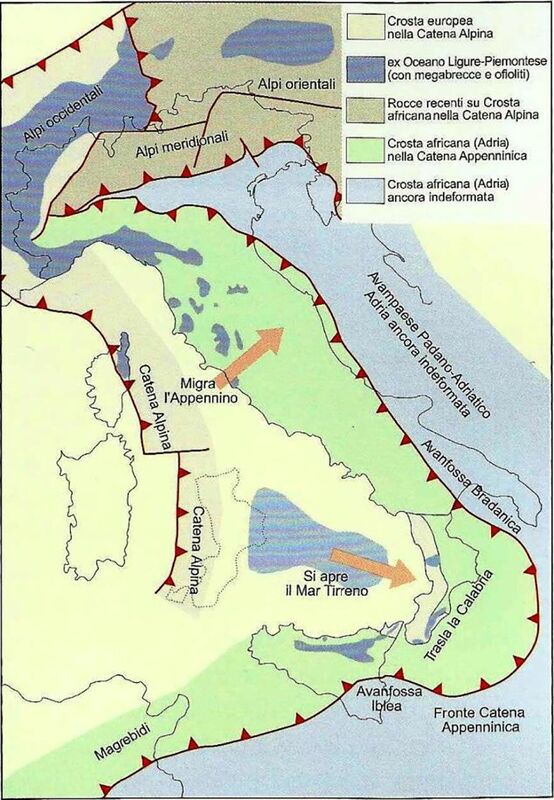 So that the Pleistocene sea placed in the Po Valley slowly recedes because there the heaviest deposit of clay sediment, until the present aspect of the Adriatic sea. During the last 500.000 years, the glaciations brought ice stripes to the Po Valley gulf, with formation of big stratums of morainic deposits which have been dragged from streams and rivers giving more complexity to the soil structure. 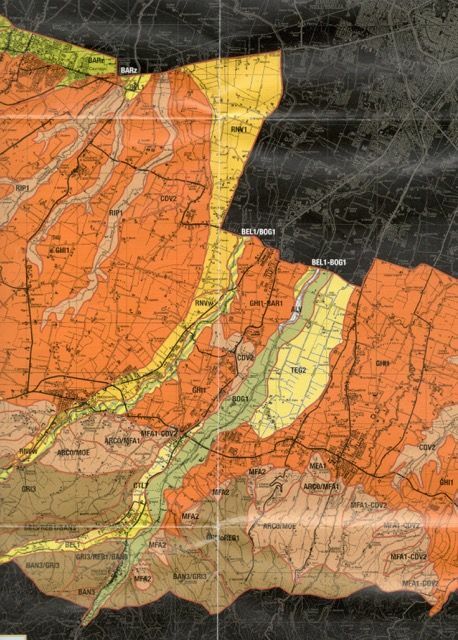 he map beside (Corrado Venturini 2011) show the regions which are protagonist of such joined formation of soils, with in plain view the red line that highlights faults moving to this day. Even now Apennines push against hills and Po valley, with light and frequent earthquakes. These 150 millions of years of motions and stratifications make our lands very rich in silt exactly because they are close to Crostolo stream and to Apennines. 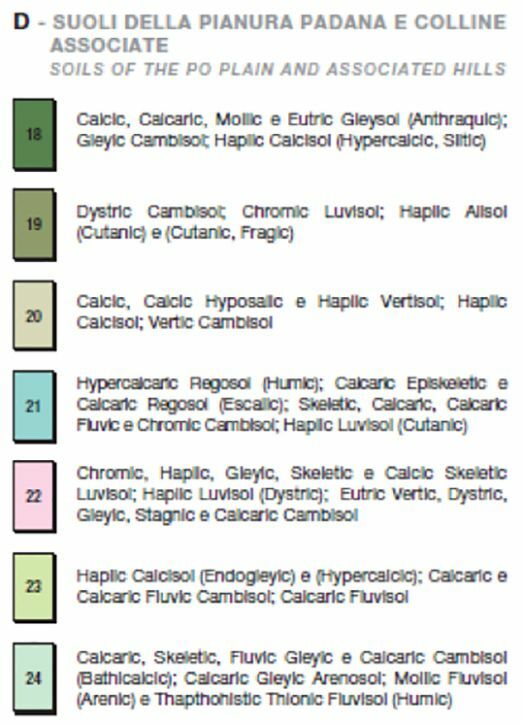 For this reason our soils are very deep and with complex silt stratifications from the ancient terraces and presence of gypsums, sands and clays. Due to this unique complexity, it’s possible a deep development of roots without fecundity and energy excesses and with a big saltiness of our musts.